Esc key away from the others. 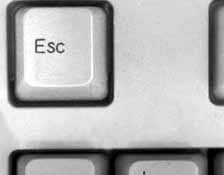 Esc (pronounced @'##~~][#&&*^%) is the first letter of the alphabet, not to be confused with the Any key. The Esc stands for Evil Sham Charade. For some reason some people believe it to stand for escape, but this is a common error. The esc key does not in fact escape from anything. It is set firmly in place. It appears to be trying to escape from the other keys, but that is just because it has bad social skills. 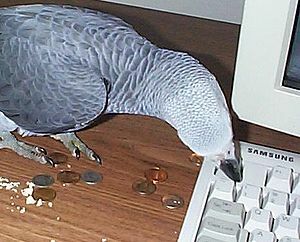 Bird pressing the ESC key to flee danger. The Esc key really does nothing like what it says it does. Most keys make a symbol on the screen resembling the key pressed or does the command printed on it. The Esc key, however, does neither. It is an evil sham charade, made by the computer manufacturers to frustrate and confuse the computer owners. The Esc key is very deceptive. Do not be fooled by its false promise of an 'escape', but instead be weary of the false hope on your computer, even before you turn it on and get dragged into an online pyramid scam. The button actually hates you for touching it. It's about time he pulled this off, don't ya think? In the case that a single press of the ESC key does not resolve a situation, it is probably due to insufficient forthrightness. Repeated hammering with increasing force is recommended. Also a good practice to do is to take a tube of super glue and pour half the tube down in it... And then hold the key down for a minute or so and then release it... Now you'll never have to press it again. It is reported that Apple Macintosh Computers include multiple escape keys, colored different translucent shades to match the user's mood. ESC keys are banned from all prison computers ever since the Great Alcatraz Typists Escape of 1969. It is also a key when pressed, links directly to a website hosted in Nigeria, and causes you to win a trillion dollars instantly. It also re-creates the USSR if provided with mayo and Cheesecake! If you have an account with Habbo Hotel, someone will steal all your furni! If not, it will Habbo you as a bogeyman who like to eat kittens for breakfast. The esc letter came from the Greek letter escepsilon. Sadly, people believe that the keypad letter means escape. It actually means escalator and when pushed it is believed to open a doorway to the skies and then Zeusis like "what's up" and tells you the meaning of life. successfully got a medal for being touched 1,000,000,000,000,000,000,000,000,000,000 times maybe more.